"One of the 61 rescued pangolins was pregnant before coming to us," Save Vietnam Wildlife, an animal rescue organization, posted on Facebook this week. "We had no idea about that until the day Hung - our head keeper - open[ed] the door to do the daily heath check on quarantine number 19." The 61 pangolins were rescued from traffickers in Vietnam earlier this month. The animals were found packed in boxes full of ice for transport. They were cold, stressed and fighting for their lives. Upon confiscation, rescuers removed the animals and started the slow, hard work of saving their lives after such an ordeal. Rescuers at Save Vietnam Wildlife are seasoned in rehabilitating pangolins since they're the most trafficked mammal in the whole world. It was a few weeks into this familiar work of building the animals' strength, so they can be wild again, when a caretaker went to check on one of the pangolins in quarantine and couldn't believe what he found. 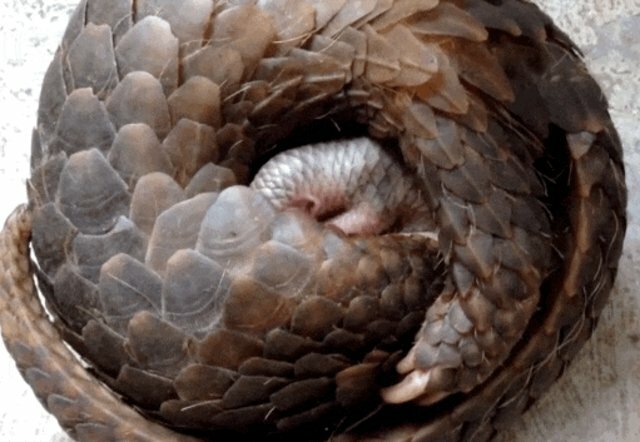 Pangolins are critically endangered not only because they are trafficked and sold for their meat and scales, which are used in traditional medicine, but also because they don't reproduce very often. So, as it is, they're being killed off at a faster rate than they can be born. But this caretaker discovered a tiny miracle: a newborn baby pangolin cuddled by his mother. "The baby and mother are our treasure, currently in best care available," the group wrote. The baby is doing fine, rescuers say, and nursing milk happily. "We will definitely release them both to the wild after the baby is mature enough," the group wrote. "[A] miracle happens. Right here. Everywhere." Click here to learn how you can help Save Vietnam Wildlife do all the work they do for animals.